When we tore out our old kitchen cabinets we held onto some drawers and door fronts. The cabinet door front under our sink sat downstairs in the pile of scrap wood. I repainted it white and then decided to do something for Halloween with it. I cut out the spider and spider web on my Silhouette, and then added some black and silver rhinestones as well. I also added some cut outs in vinyl from my Silhouette machine to various bottles. I did not put anything on the one bottle because it already says Worm Syrup on it. I thought was fit in pretty well with the Halloween vibe. 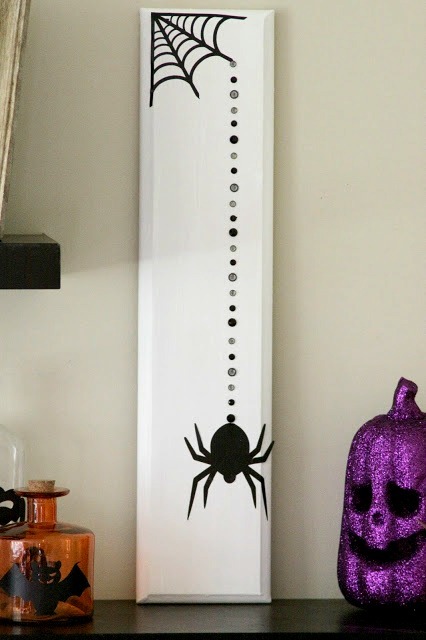 A few quick and easy Halloween projects that make me smile. Thanks so much for stopping by! Very cute Halloween crafts Megan! You are really making great use of you Silhouette! No wonder Wynn wants to know what she'll be for Halloween :). I love the repurposed drawer front. Brilliant! Oh these are adorable! I LOVE the spider sign. Great idea on saving those cabinet doors! Oh I love that spider sign! It's spooktacular! And now you have me thinking of what vases/bottles I have lying around that I can decorate w/ some vinyl. So cute! I especially love the spider sign! You come up with the cutest quick crafts! I have 3 bottles sitting on my cabinet just waiting for me to put something on them! Thanks for the inspiration! Love LOVE that spider sign! You rock! I never thought I'd say this about a spider, but it's really pretty! I love the black and white contrast and the rhinestones just make it! Cute, cute, cute!! I popped over from Monday Funday-- thanks for sharing! So cute! What a great idea. Thanks for sharing at Monday Funday! Cute! I have some drawer fronts too that I picked up at a Habitat Restore for whatever came to mind. I love that cabinet door spider! So clever! I'm featuring you on Sunday! :) Thanks for linking up to the "Get Your DIY On" link up party! Hope to see you back on Sunday at 7:00 with your spooky outdoor décor!